Pursuing your songwriting hobby, or passion for songwriting, doesn’t have to mean you give up your job and run off on a new life. Actually, scientific studies show that pursuing a passion or hobby can bring not only health benefits, but mental health benefits to your life. According to the study cited in a New York Times article on the topic, researchers found that participants who engaged in hobbies were 34 percent less stressed and 18 percent less sad during the activities, as well as for some time after. One of the biggest deterrents to people pursuing their hobbies – they feel they have no time. Or worse, their hobby doesn’t have a true purpose or contribute to your household bottom line, so it’s frivolous. You have to get past that! 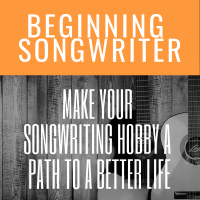 Your hobby – perhaps songwriting – has a true upside, whether that’s monetarily in the form of a new career path, or just emotionally. Can you identify some time that might be used better? If you have kids, can you trade “free time” with a friend? There’s no need to come up with a full business plan!